When we start talk on blogging niche, lots of ideas start coming in our mind and majority of minds end up with Tech blogging or health tips (Weight loss tips, Acne and others). I don't know why the people are being mad behind these niches. Ahh! If you are thinking that Tech blogging is one of the niches, which I asked in title of this post, then you are totally wrong. World, No need any more tech bloggers. There are already too many tech bloggers, so they don't care about and will not take any more interest in new tech related blogs with the same Ideas and posts in different ways. Moreover, there is a large competition among tech bloggers, so how it will possible to succeed a new and unexperienced tech bloggers compete present ones. Most search keywords in tech blogging already got a rank for some specified blogs. Why are you trying for only tech blogging? If you are fresher and thinking to blog and have idea of tech blogging then leave it now if you want to be succeed in blogging or later you will leave blogging after getting no results from this large competition. Same thing is happening with health related blogs. When people divert their minds from tech niche, the next niche infront of them is of Health tips and start writing on some common niches on helath like, Weight loss tips, Acne treatment and so on! But Why?? Again, already too much bloggers are blogging on same niche. If you really want to succeed in blogging then why you don't start participating in blogs having less competitors. Why you think that people are searching only for tech, mobiles, internet, technology, blogging, SEO, videos, weight loss tips, acne are many other terms related with this? Have you made any research before starting your blog? I know majority of answers is 'No'. They are just inspired and excited by already running blogs on niche on which they have started. Because, if they made research before starting blog, definitely they never choose these type of niches with high competition for blogging. Well, after the research of 17 days, I found two most profitable niches for blogging. These two niches are new and having very less competition with good number of searches with higher bids in major search engines like Google and Bing. I will show the data of searches in this post. Cryptography is a process of protecting information by transforming it in cipher text, which is an unreadable format. This information can decipher by only those who have the secret key which convert the message in plain text. Cryptography is very necessary for Network security. Read more about Cryptography to understand the cryptography in detail. The niche Cyptography has 80,000 searches per month in Google and by adding data of other search engines it will be 200,000 approx. All these data is only for four different keywords under Cryptography, i.e., cryptography, what is cryptography, cryptologist and define cryptography. Check exact data, searches and amount of bids on particular keywords in below image. Conjunctivitis is an inflammation of the conjunctiva of the eye. It is health related problem of eyes. The term Conjunctivitis has searches in Google for 1 month is 1 Million. 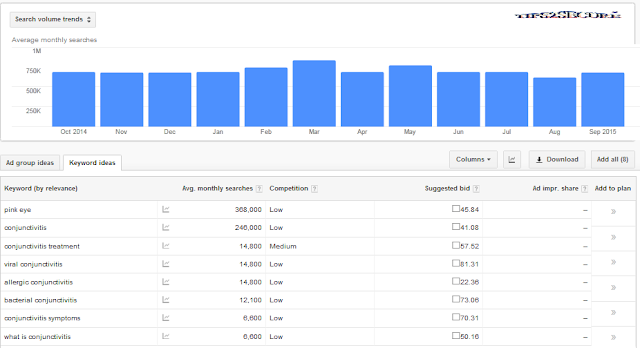 It will be total of 5 Million searches in one month as the total of searches from all major search engines. This data is derived for Eight different keywords under Conjunctivitis, i.e., pink eye, conjunctivitis, conjunctivitis treatment, viral conjunctivitis, allergic conjunctivitis, bacterial conjunctivitis, conjunctivitis symptoms and what is conjunctivitis. Check exact data, searches and bids in below given image. I highly recommend the freshers and newbie bloggers to go for any of above discussed two niches. Above discussed niches are very less competition and makes easy to rank your blog in search engine result pages without much effort and competition. Message: I hope that you have enjoyed '2 Most Profitable Niches for Blogging in 2015-2016' article. However, if you want me to deliver more items then please share my post. You can use Social Sharing Widget provided at the end of every post. After all, Sharing is Caring! Thanks for sharing two less known profitable niches. But could you please tell me how can I find some more profitable niches, with less competition? 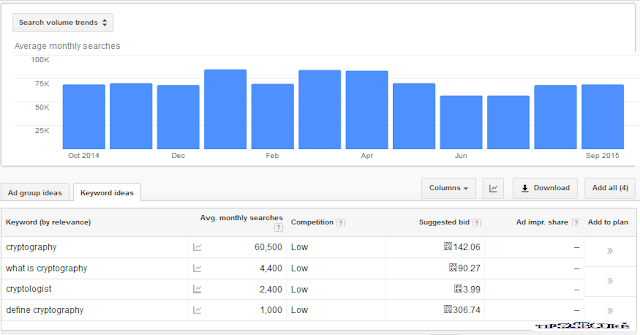 If you want to just check monthly average searches then Adwords keyword planner is good for you, but if you want to have competition data then you must use SEMRUSH Tool. Thanks for this beatiful thought.i am already Running a tech related blog from past year.And i am still getting only 500 Unique visitor per month only for this high competition.so i am already think about to change my niches for my blog or open a new blog.so your article is now inspiration for me.thanks buddy.